Gerhard Richter Painting offers a rare glimpse into the creative process and working methods of one of the world's most respected artists. Born in Germany in 1932, Gerhard Richter was a child of World War II, spending his early years in Dresden before it was destroyed. He began studying art in 1947, and by the late 1950s was exhibiting regularly. He has been celebrated for his realistic paintings, which often incorporate photography, as well his abstract work. 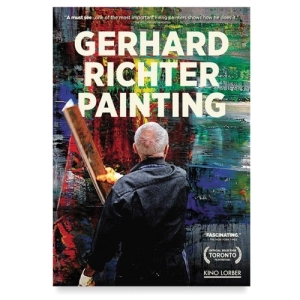 Filmmaker Corinna Belz focuses on Richter's technique (using modified squeegees as well as brushes) and his routine in the studio, allowing the artist and his work to speak for themselves. She also presents a profile of Richter's history via rare interviews and newsreel footage, then follows the artist as he prepares for an exhibition of his new work.